Eternal Orthodox Church calendar for the 22.05 year 2017. This great prophet was of royal lineage. Isaiah was born in Jerusalem of Amoz his father who was the brother of Amaziah, the king of Judah. By the great grace of God that was in him, Isaiah was made worthy to see the Lord Sabaoth on the throne in heaven surrounded by six-winged Seraphims who continuously sing: "Holy, Holy, Holy, is the Lord of Hosts (Sabaoth)" (Isaiah 6:3). Isaiah prophesied many things to individual men as well as to the people. On one occasion, he walked naked around the streets of Jerusalem for three days prophesying the imminent fall of Jerusalem by the Assyrian King Sennacherib, reminding the king and the leaders of the people not to hope in assistance from the Egyptians or Ethiopians for they, also, will be subjugated by the same Sennacherib, but rather to trust in help from God the Most High. This prophesy, as well as other prophecies, were literally fulfilled. Isaiah's most important prophecies are the ones concerning the Incarnation of God, the conception of the All-Holy Virgin, John the Forerunner and about many other events of the life of Christ. ("Therefore, the Lord Himself shall give you a sign; Behold a virgin shall conceive, and bear a son, and shall call His name Emmanuel" (Isaiah 7:14). "For unto us a child is born, unto us a son is given; and the government shall be upon his shoulder: his name shall be called Wonderful, Counselor, The Mighty God, The Everlasting Father, The Prince of Peace" (Isaiah 9:6). "The voice of him that cries in the wilderness, Prepare ye the way of the Lord and make straight in the desert a highway for our God" (Isaiah 40:3).) This discerning man, because of the purity of his heart and because of his zealousness toward God, also received the gift of working miracles. Thus, when the besieged Jerusalem suffered from drought, Isaiah prayed to God and water flowed from beneath Mount Zion. This water was called Siloam which means: "sent." Later, the Lord directed the man, blind from birth to bathe in this water in order for him to see. During the reign of King Manasses, when Isaiah thundered against the pagan customs of the king and the leaders comparing that generation with Sodom and Gomorrah, the anger of the leaders and the people rose up against this great prophet. He was captured, led out of Jerusalem and was sawed in half. Isaiah lived and prophesied about seven-hundred years before Christ. 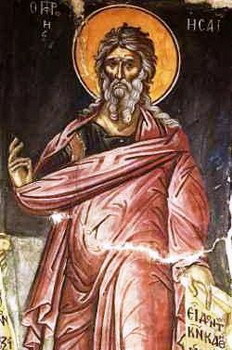 During the reign of Emperor Alexius Commenus and Patriarch NicholasGrammaticus, the body of this saint was translated from Myra in Lycia to the town of Bari in Italy in 1007 A.D. This occurred because of the assault of the Muslims on Lycia. 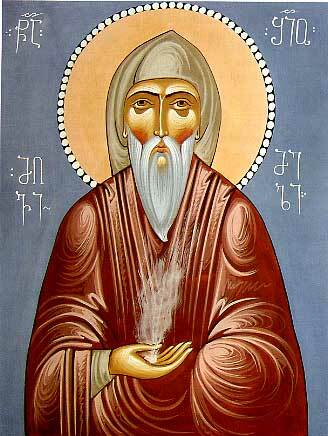 The saint appeared in a dream to an honorable priest in Bari and ordered that his relics be translated to this town. At that time, Bari was Orthodox and under the Orthodox Patriarch. 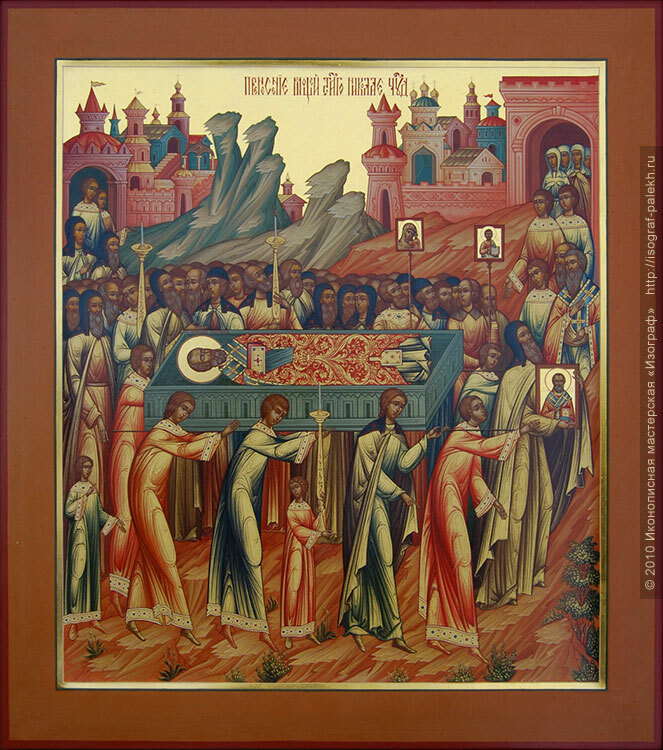 During the translation of the relics of this saint many miracles occurred either by touching the relics or from the myrrh (oil) which abundantly flowed from his relics. "Also on this day, is commemorated the miracle of St. Nicholas to the Serbian King, Stephan of Decani: how St. Nicholas restored the sight to the blinded King Stephan. Christopher was a great miracle-worker. He is especially venerated in Spain. The people pray to him primarily for protection from contagious diseases and great pestilence. He suffered for Christ and was glorified by Christ in the year 249 A.D. 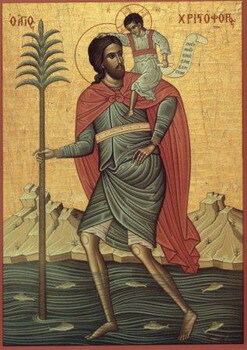 The Holy Martyr Epimachus the New suffered in the city of Alexandria in about the year 250, under the emperor Decius (249-251). He was scourged to death with lead rods. His relics are located in the Roman catacombs. The Holy Martyr Gordian was beheaded with a sword in the year 362 under Julian the Apostate (361-363) at Rome. His relics rest in the Roman catacombs.